In July 1975 I married and moved into my first home in Max Road Knotty Ash … It was a three bedroom terraced house and the full row of houses backed onto Yew Tree cemetery. Immediately through the front door were the stairs leading up to the bedrooms and to the left, a doorway to the only living area which led through to a small kitchen and the bathroom. Shortly after I moved in, I was taking the laundry upstairs and went from the living area to the stairs when I was stopped in my tracks … Sitting halfway up the stairs was a young girl. She looked about 4 or 5 years old – I remember she had dark hair and though I don’t exactly remember what she was wearing… I don’t recall thinking anything other than she must be a neighbours child. I think I said hello and she just looked at me and walked up the stairs and vanished! I could clearly hear her footsteps as she walked up the stairs. I never saw her again but heard her many times. Often I could hear her walking up and down the stairs and sometimes she would whistle, the whistle like a child makes, sucking in through their lips rather than blowing out. I could often feel her near me in the living room and the kitchen and many times the radio would go on and off … sometime the sound would be turned up and down but I was never afraid. 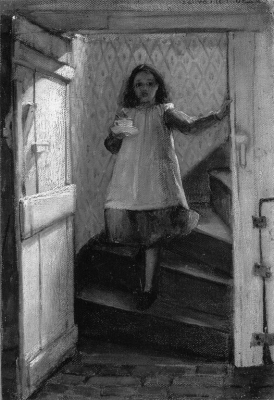 After a while I became friends with a neighbour who had quite a few children, her youngest daughter Sarah looked quite a lot like my ghost girl as it happened and she often came to my house along with her mum and whilst we chatted she played. Then one day Sarah asked me what my sister’s name was… I said I don’t have a sister. She said you do, she sits on the stairs and plays with me but won’t tell me her name. I asked Sarah if she saw her a lot in my house and she said yes she did. Two years later we moved … It was nothing to do with my ghost girl, my then husband and I both worked so were able to move to a bigger house in another area. 6 months later whilst at work a young man came to see me. I didn’t recognise him at first and he reminded me that he and his wife had bought my home in Knotty Ash. I asked him why he wanted to see me and he looked disturbed… He said he wanted to know if I could shed any light on the ghost girl in their home. I was amazed! Seems his wife had seen her many times, not only on the stairs but also in the kitchen. It was the same little girl and he just wanted to know if that was why I left and was there anything to be afraid of. I told him in all honesty that I never felt scared nor did I leave because of the girl. I never found out who she was or indeed whether she still walks that house either…..